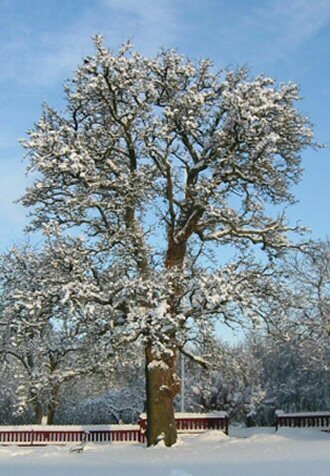 Pear Tree is the estate special tree.It were planted in 1820 , Paul Andersson Gutenberg was the master at Stenstugu . He had married in 1806 by Dorothea Hansdotter, daughter of Stenstugu. When Dorothea died in 1819 they had three sons, the youngest had not filled five. A year later Paul remarried with Butvid Larsdotter from Skällhorns in Källunge , she was called Bodilla. 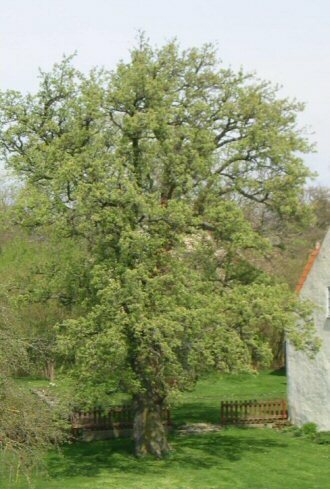 When she arrived as newlyweds to Stenstugu she had pear tree with her in the apron as a small plant. Location at the western end of the wing, just outside the brewhouse was favorable for the small plant. There used to be a door on the gable and a stone staircase outside, the door was removed when the house was converted into a residence from 1976 to 1977. What remains is a wall cupboard in the wall. To the right of the staircase from the outside was a hole in the wall where the water from washing slaughter and brewing ran out, so the tree had a good supply of water and nutrients. Once the tree has grown big and gained a strong branch to the south, it makes service at the slaughter, the pig was hung up in it for a final cleaning and to cool before cutting. The pears are small and round and do not mature until the end of August, September. They are pretty hard, so eating them raw is not an option, but dryed or cooked are they good . When washing the pears and gave them a brief boil, to remove stem, cut off the flower and cut in halves. The pears placed on a sheet of wrapping paper and a newspaper under, and placed in the oven at 50 degrees, the door is left little open. After few hours, you can turn the heat off and turn it on again when cool. When you think they're sufficiently dry, you can freeze them. Should we keep them in the tin can as my grandmother did they must be thoroughly dry before you interrupt the drying process. It is useful candy but you must let them soften in the mouth before you chew, otherwise you can destroy teeth. Earlier they made fruit soup of them along with the apples were peeled , sliced ? ?and dried. 10 liters of pear , 2.4 kg sugar, 2 dl vinegar, 3 dl water . The pears are added to the pan unpeeled. Boiled gently for about 2 hours or until they are brown in color and the skins shrivel. The fly is removed before cooking. They are served with whipped cream. The pears stays long, if you put them in jars and pour on the fruit broth as it stands over the pears , and keep the cans cold. Earlier they preserved by hermetrisk preserving . 10 liters pears and water. To the broth : 1 kg sugar , 2.5 dl of vinegar. 1hg ground mustard, horseradish cubes. The pears are washed and cooked, raised and allowed to cool. Of 2 liters of the water the pears was cooked in along with sugar and vinegar are boiled a broth that turned over the pears, after they added alternate in a pot of mustard and papparrot between.